It is very easy to twist the wrong knob when locking the plunge on routers such as the DeWalt DW613, Trend T5 and similar models. Brightly coloured insulating tape around the plunge knob helps prevent this. It is particularly useful when the router is inverted in a table. 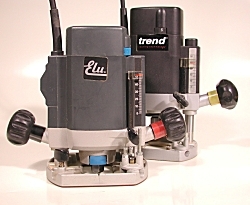 The photo shows my Elu 96E and Trend T5 routers with their plunge lock knobs taped.